I love fresh vegetables and my husband and I both enjoy our vegetable garden. Every year we plant yummy veggies and strawberries too. This year the weather here (it was still snowing here on Friday) kept us from putting our starters in the ground. I started plants in a little hothouse in our kitchen window. This year we are excited about adding green beans to our garden. Yes, we get excited about green beans…sigh. They grew well along with all of our other plants, and they were ready to go in the ground. But, the ground wasn’t ready. I transplanted my starters into pots and soon, I had wonderful jungle of green in our kitchen window. Take a look at these green beans! So the next time you pick up some kitchen cut green beans from your market, remember they actually grow in the kitchen! Who knew, giggle. Oh, that's funny that they grew indoors! I just planted a bunch of herbs, one tomato, one hot pepper, and one green pepper plant. I love the fresh stuff! That is too funny! Who knew? yummy veg! Looks great! Am not much of a gardener but I admire people that are and that grow their own veg so well done! We can't seem to grow anything, but we do enjoy fresh veggies. Maybe we should try an indoor garden as bugs get the sprouts outdoors. How fun and fresh veggies are the best! I didn't know that. We to love fresh veggies. I'm hoping to plant next weekend as it keeps getting cold here as well. Fresh veggies…fresh veggies…I want fresh veggies. LOL. I have seen tomatoe plants start to grow but never beans. Too funny, I also used to start pole beans in the kitchen but never got them too big. However, I once planted them in ped pots and put the pot and all in the ground. It didn't work. The greenhouse said the roots are not strong enough to eat through the fiber pots. Giggle. I don't have enough sun for a veggie garden, just a few spots for tomatoes. But when I bought fresh beans for $.99 a pound this weekend, instead of the shopping $2.49 a pound they have been for months, I had waited so long to taste fresh again, it felt like I had grown them myself. They grow in your kitchen if you don't have les black thumbs like moi! HA! Actually that is really cool! Good for you! Fresh veggies are the best…the joys of summertime! I had no idea! I must try this. I am going tomorrow to look for herbs and peppers. Nothing, nothing like the fresh stuff! I like the idea of starting them indoors first. Our season here is so short it would really help. We are really late getting started this year, weather has been strange. Hope maybe this weekend. Thanks for the tips and thanks for stopping by my blog and becoming a follower. Yum they look delicious!!!! I would love to have a veggie garden at our lakehouse but my hubs is nervous about it attracting bears. We had a bear come one week while we were away and climb alittle ways up a tree, take down a bird feeder and eat the bird seed! 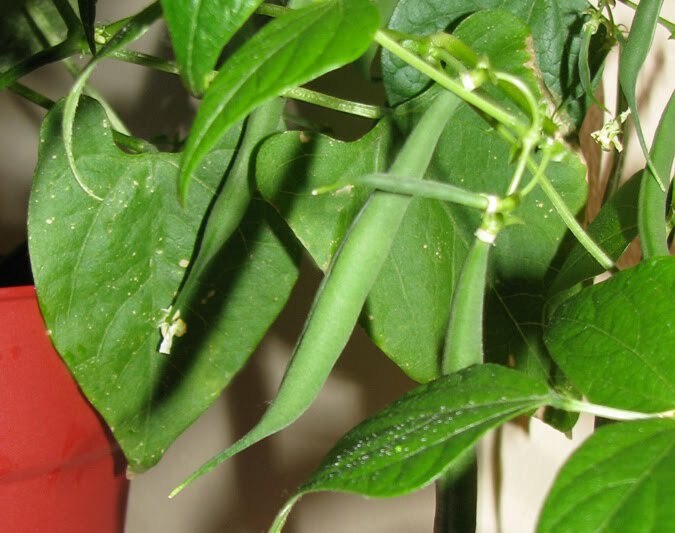 That is a new one, that green beans grow in your kitchen. My dh and I plant strawberries and green beans too. However, seems like we can NEVER get enough fruits & vegggies in our diet do we ?